The farmers choice for producing consistently short material from dry bales, as short as 35mm. Blow straw up to 30', discharge to one or both sides of the tractor. Alternative delivery chutes are available to suit your requirements. The Tomahawk 404M, 505M and 505XLM bale processors use blades or hammers to chop dry material small enough to pass through the holes in a screen. A range of screens are available with holes from 15mm to 36mm to obtain material of a consistent chop length. Tomahawk 404M - Suitable for 1.2m (4') diameter bales. 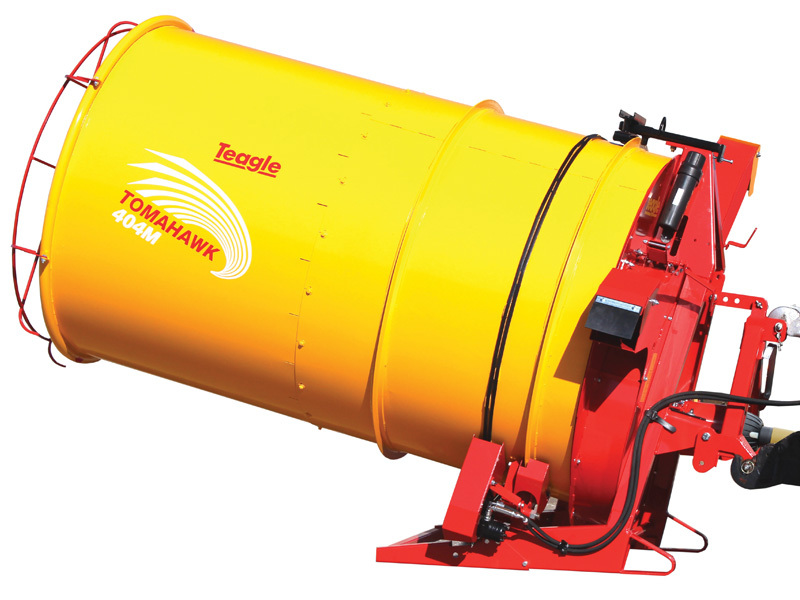 Tomahawk 505M - Suitable for 1.5m (5') diameter bales. 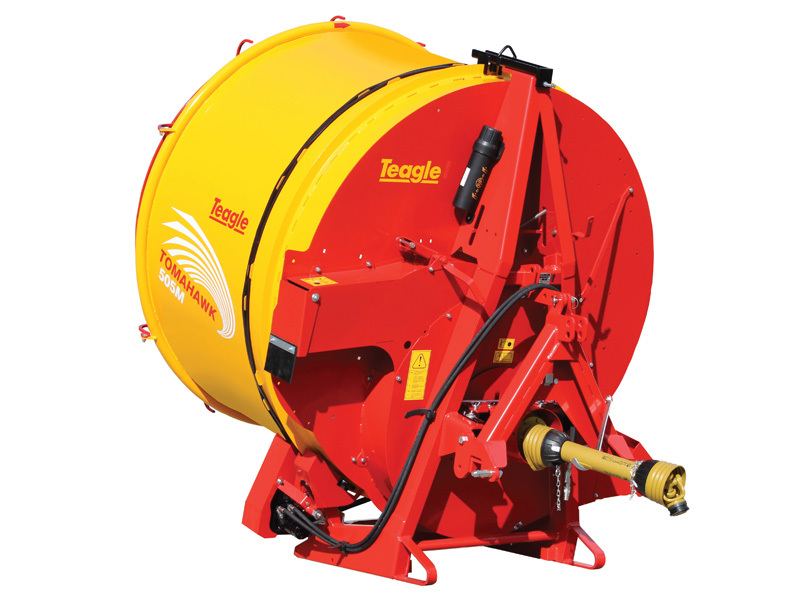 Tomahawk 505XLM - Suitable for 1.5m (5') diameter bales and full size Hesston bales. The 404M/505M/505XLM range is suitable for dry material only, and will not cut silage as it will block the mill sieve. 30, 60 & 120 cm. Length of material is determined by the screen. The nature of the material has some effect upon actual shredded length and some variation is likely to occur. Screen sizes available are 10, 12, 15, 18, 21, 28, 36, 50mm holes and 120mm slots. Heavy duty, strong enough to allow you to change the angle of the machine whilst the drum is loaded. Only suitable for dry material. It will blow long straw up to 12 metres at 1000rpm. Quick attach A-Frame, allows quick coupling of the Tomahawk onto the tractor. Electric motor drive options available. Contact us for more information. 1.5m and 1.8m long drums are also available so a second bale can be loaded before the first is finished, to maintain a consistent feed rate and chop length 2.5m long drum x 1.5m diameter, available only on the Tomahawk 404 - 404M - 4040. To control delivery, available on all Giraffe Chutes. Takes full length rectangular bales 1.25 x 1.25, or two round bales. Centre supports for strength and reliability. Discharge height on 505M 3m (if Tomahawk is lifted 30cm above ground). Dry material only. Optional motor kit available.